Hello! How tall of a wine bottle can the shelves accommodate? We may use this to store bourbon bottles...some of those are almost 14 inches tall. Thanks! 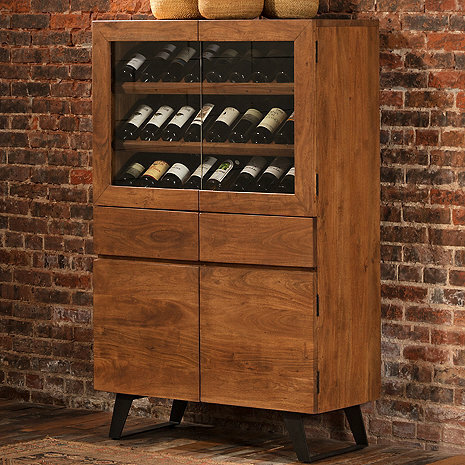 BEST ANSWER: The Cassis Wine Storage Cabinet has a lower storage area with a removable shelf. This area is 20 inches high, so you can definitely store your bourbon bottles there. How many bottles can it hold? Thank you sir! Got it, 3 rows of 9. Can a locking mechanism be put on all the doors as we are thinking about putting expensive bottle in the glass area to be viewed, and storing retail products like Coravins and such in our wine shop? BEST ANSWER: The Cassis Wine Storage Cabinet does not come with a lock but I am sure you can have one (or more) placed on this cabinet to protect the contents. On my screen the wood coloring against the brick wall is like a medium walnut. In other pictures the cabinet almost appears like a white oak. Which is a better representation of how it appears in person? BEST ANSWER: The Cassis Wine Storage Credenza is closest to the photo with the brick wall. The unit is a warm medium brown. Hi. My wife and I are looking for a wine cabinet that is very similar to the ones you stock. Do you have any distributors in Australia? Love, Love our new wine cabinet! We love the look of our new wine cabinet. It is handsome and charming and really makes a statement. It is well made and holds both our wine and liquor below to the left and our wine glasses on the right. I especially like the modern look of the legs with the warm artisan wood. Thank You for an excellent product.